Experience some of Utah's best variations on classics from back East. Although it's been 20-plus years since I lived on the East Coast, I still find myself trying to satisfy cravings for foods the Eastern Seaboard is known for: killer cheesesteaks, hoagies, pizzas and the like. Thanks in large part to Easterners who have uprooted themselves and set up shop here in Utah, it's getting easier to try a taste of those unique flavors. Here are a handful of eateries that deliver the goods, from New York, New Jersey and Pennsylvania—straight to the Beehive. For a few years now, many folks looking to satisfy their New York-style pizza urges have turned to Este Pizzerias in Salt Lake and Park City. And those are fine choices. But did you know that founder Dave Heiblim and partner Rob Reinfurt have branched out and opened an East Coast-style deli? Appropriately enough, it's called Este Deli (1702 S. Main, Salt Lake City, 801-487-3354, EstePizzaCo.com). I knew this was the real deal when I saw the roast pork sandwich on the menu. How did I know? Because it came adorned with broccoli rabe, roasted red peppers and sharp provolone cheese—just the way it oughta. Pork shoulder is slowly braised, the way they do it at Philadelphia landmarks like Tommy DiNic's or John's, then served with the aforementioned accoutrements. The sharp provolone and broccoli rabe really elevate this sandwich to the status of heavenly hoagie. And, regarding the Philly cheesesteak, my son said to me "This is one of the best cheesesteaks I've ever had!" He should know; he lives in South Jersey just a stone's throw from Philly, and considers himself a cheesesteak connoisseur. Other specialties include the Pittsburgh hoagie (with navel pastrami, sharp provolone, house slaw and french fries), and the C.A.M.P., which is breaded, crispy fried chicken with arugula, fresh mozzarella and roasted red peppers. The road construction in front of Nuch's Pizzeria and Restaurant (2819 S. 2300 East, 801-484-0448, Nuchs-pizzeria-and-restaurant.com) can't be good for business, but I'm confident Nuch's will survive, given that it's the go-to spot for many locals on the lookout for New York-style pizza. These pies are thin-crust and come in two sizes—12-inch and 16-inch—baked in a brick oven. My favorite is what the menu unpretentiously lists as "plain." It's a simple pizza with near-perfect crust (perfect if you eat in when it's fresh; less so to-go) slathered with not-too-much and not-too-little tomato sauce with an excellent sweetness-to-acidity ratio, and topped with high-quality mozzarella. It's an easy thing that so many people mess up. For those with an urge for the New Haven-style pizzas they remember, Nuch's has one with Yukon gold mashed potatoes, roasted garlic, bacon and asparagus. Give the calzones a try, too. I've been around long enough to remember when Joanna Rendi and Don MacDonald opened Moochie's Meatballs and More (232 E. 800 South, 801-596-1350, MoochiesMeatballs.com) in the back of the little Circle Pottery Gift Shop where MacDonald made pottery. That was in 2003. Since then, two additional locations have opened—one in Midvale, and the other in Lehi. It's not surprising that Moochie's would serve up some of the tastiest cheesesteaks on this side of Philly. Rendi's cousin is the owner of the original Tony Luke's, which many aficionados say makes the best cheesesteaks in Philadelphia. I've had them myself, and I wouldn't disagree. But, even as much as I love the cheesesteaks at Moochie's, it's the East Coast-type sandwiches—like the salami and provolone combination, or the grinder with homemade meatballs and marinara sauce that Gur Fieri raved about on Diners, Drive-Ins and Dives—that keep me coming back. Anyone who has spent time at the Jersey Shore, on New York's Long Island, Cape Cod or at any other East Coast beaches has probably come to love fried clams. They are a staple of summers at the shore. But they are notoriously difficult to find here in the Beehive. And who'd think you'd find fried clams—admittedly not a "gourmet" food item—in Deer Valley? But Cena Ristorante at The Chateaux (7815 Royal Street East, Deer Valley, 435-658-9500, The-Chateaux.com) has them. The large clams are battered and deep-fried to a gorgeous golden color, with a crisp, crunchy crust. And, like the real deal, these are served wrapped in newspaper, but with a classy added touch: a spicy yellow tomato sauce for dipping. No one believes me when I tell them that quite possibly the best East Coast-style pizza I've had in Utah is to be found at the food court in the Layton Mall, but it's true. Charlie Wallwork and his family run the independent—Sbarro this is not—Tossed Pizzeria (1201 N. Hill Field Road, 801-546-3558, TossedPizzeria.com) there. Their signature pies are cooked for 180 seconds, and none is better than the aptly named "New York-Style," which is exactly that: hand-tossed dough topped with homemade tomato sauce, Grande mozzarella (the best shredding cheese) and whatever additional toppings you'd like. I've tasted pizza in New York City that wasn't nearly as good as these. For a pie with a bit more meat on the bone, try "The Brooklyn." It's got a base of housemade plum tomato sauce and toppings of Grande mozzarella, sliced housemade sausage, pepperoni, ham, green olives and sliced fresh mushrooms. Do I even need to mention Feldman's Deli (2005 E. 2700 South, 801-906-0369, FeldmansDeli.com)? Only if we want to talk about a real Jewish deli in Zion. 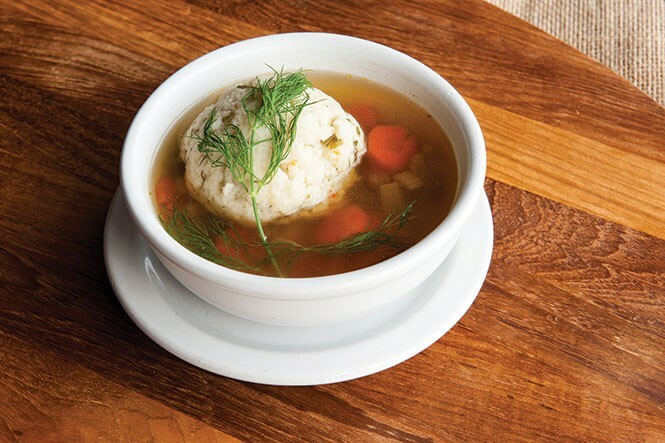 At Janet and Michael Feldman's delicatessen, you'll find food that can bring tears to the eyes—like housemade matzo ball soup (with just the right amount of schmaltz), gefilte fish or incredible boiled-and-baked bagels, or ... Just go and eat already.